President Trump’s children, Sens. 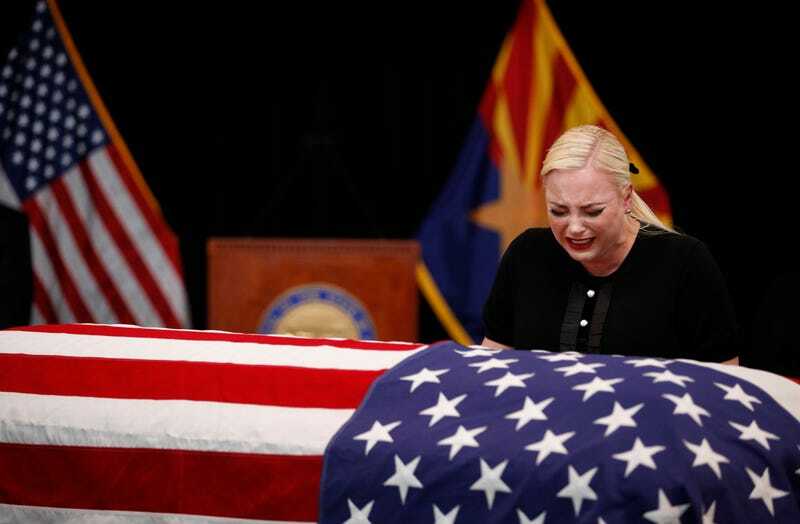 Mitch McConnell (R-Ky.) and Lindsey Graham (R-S.C.), will fight for their father no matter the circumstances, but beefing with a dead war hero is a bridge too far even for the president’s most famous sons. For some reason, unknown to Satan and the birds that kicked it with the Wicked Witch of the West, the president of people who didn’t owe this tax season has decided to pick a fight with deceased Sen. John McCain. He’s literally kept McCain’s name in his KFC-grease-saturated mouth or on the tips of his un-Vaselined fingers for the past five days. For five days the president has been relentlessly bashing a deceased war hero who survived being captured and tortured during the Vietnam War that left him disabled. He would later serve as a beloved Republican senator for Arizona and died last year after a long battle with cancer. Only a day after Trump told reporters that he was “never a fan of John McCain and I never will be,” Trump doubled down at an Ohio tank manufacturing facility on Wednesday, where he claimed he never received a thank you for “approving” McCain’s funeral service on Sept. 1. Even the crowd, which was fully pro-Trump, was shocked. Several Republican senators have come out against the president’s attack against McCain. Sen. Lindsey Graham (R-S.C.) could only bring himself to say “I don’t like when [the president] says things about my friend.” But I’m convinced that Trump has a dossier on Graham. Is Donald Trump Lindsey Graham’s personal Vladimir Putin? “I think the president’s comments about Sen. McCain hurt him more than they hurt the legacy of Sen. McCain. I’m going to try to continue to help the president,” Graham told reporters in South Carolina. “My job is to represent the people of South Carolina. They want me to work with the president where I can. I’ve gotten to know the president. We have a good working relationship. I like him,” Graham said. “I don’t like when he says things about my friend John McCain. The best thing that can happen, I think, for all of us, is to move forward,” he added.